I was pleasantly surprised to find that Bunn's voice is as vibrant and skillful as ever but as the creator of Harrow County, The Sixth Gun, and The Empty Man I really shouldn't be surprised at all. This story has some personal history for Bunn as the idea was spawned a long time ago when his dad was performing past life regressions as a hypnotist. Most folks who go under can verbalize their subconscious mind revealing past events. What if a subject couldn't verbalize it? What unspeakable acts could be hidden in one's past that would leave them speechless? Unfortunately, for Adrian, some of those horrors manifest themselves while very much awake. Imagine seeing grotesque swarms of bugs being expelled from people's orifices in your everyday life. It's a nauseating reality for Adrian who gets these hallucinations often. And it's getting worse. A friend recommends seeing a hypnotist and despite his skepticism, he agrees. It takes him down a strange path while he's under, replaying moments in his life and some he probably didn't know were there. While he has no recollection of what he just saw, something or someone has followed him from the depths of his subconscious. Aiding Bunn are some extraordinary artists that help make this tale even more frightening. Danny Luckert has a clean smooth style whose linework is exquisite and designs are almost photo-realistic. 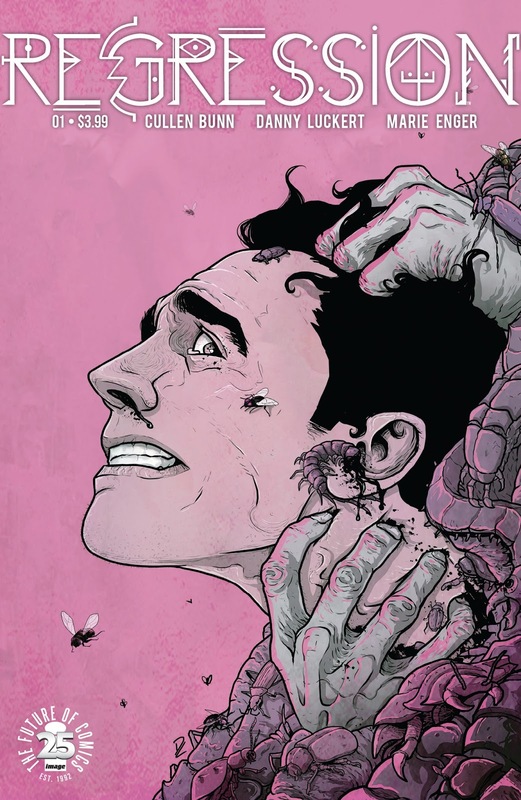 This crisp and clean approach featuring a ton of detail in every panel is juxtaposed against a bevy of filthy, squirmy, pile of maggots, worms, roaches, beetles, flies, and god knows what else. It's the perfect shock to the system when things get dark and gruesome. Marie Enger uses some deep gradients of warm colors to flesh out the panels and it looks lush and inviting. It helps to draw the eyes further into the panel but also make you jump when a knife comes out, for example. Cullen Bunn has another winner on his hands with 'Regression.' A horror story that will unnerve you and shock you. Luckert and Enger help bring it all to life with glorious and grotesque art. It'll creep you out, maybe even gross you out but it'll keep you engaged the whole way. 'Regression' sets the tone right away and keeps you hooked.